Thanks a lot Nandan & Vibha. It was pleasure to meet you guys. I think this article deserves Mahesh’s Ghumakkar photo. What say? Yes. Let me ask Mahesh to send his Ghumakkar photo, the one with Ghumakkar bag, car sticker. I hope u must have received the Photograph. Great reading your interview, getting to know about a serious Ghumakkar – I enjoyed it thoroughly. I am with your co-workers on ‘Encyclopaedia’- your informative articles are testimony to that. 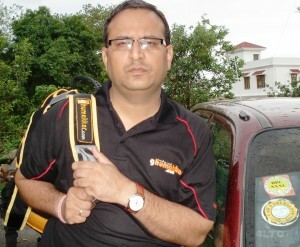 @ Nandan, such interviews are great idea – fully endorse. Seems there is always something new on offer in Ghumakkar – (discovered this site thanks to your mail on Manish). Pingback: Featured Author Interview with Warm and Kind Mahesh Semwal / Ghumakkar – Inspiring travel experiences.